Manny Pacquiao, shocked the world this past weekend when he signed up with MMA promotional company, RIZIN. He is expected to make an appearance on the April 21st, super show. For those of you that are expecting to see Pac-man mix it up in the octagon can think again. 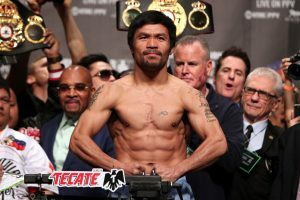 Pacquiao will play the roll of a Filipino Ambassador. On the card that night will be Tenshin Nasukawa who is most known for his failed attempt to defeat retired all-time great boxer Floyd Mayweather earlier this year. That contest gained public notoriety but the match itself was an utter mismatch as Mayweather dismantled Nasukawa. Pacquiao publicly criticized Mayweather for his exploits. Although Pacquiao seemingly has no intentions of following his longtime rivals blueprint. RIZIN president Nobuyuki Sakakibara has plans of his own to make it a reality. Not only does he have visions of having Pacquiao compete in the same fashion that Floyd once did but he already has an opponent in mind as well. For those unfamiliar with Gomi he is a long time veteran in the world of mixed martial arts. His professional record stands at 36 wins across 15 defeats. If these two were to matchup he would hold the advantage in terms of experience but when we take a deep look at his record it appears he is on the downside of his career. He has lost six of his past seven contests, also more importantly he is 40 years of age. Does anyone truly want to the future hall of famer step inside the ring against Gomi? The answer to that question should be no. Could there be potentially a big pay day for him if he did indeed go through with what many believe would be a farce level match up? Absolutely.